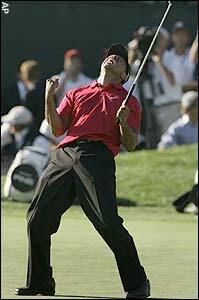 Tiger is Back — YES!!! I am sooo excited to see Tiger back – golf just has not been the same! This is the picture that the sports world has been missing for the last eight months while Woods has been healing from surgery to rebuild his left anterior cruciate ligament: the rocket tee shots and trundling chips, the dynamism and charisma of an athlete in his prime. Though Woods’ return this week, at the Accenture Match Play Championship at the Ritz-Carlton Golf Club near Tucson, is not unique in the annals of sport, the circumstances surrounding golf and the world beyond seem to cry out for his presence. The economy is tanking. The best player in baseball admitted to using performance-enhancing drugs. Golf sponsorship has become more risky amid falling television ratings and tightening purse strings. Even in the calm after football season and before the basketball postseason, golf has had trouble making a dent — until now. That Tour commissioner Tim Finchem saw fit to release a statement after Woods’ announcement — “We are delighted that Tiger is returning to competition,” Finchem said — only underscores Woods’ meaning to the game in good times and bad. Finchem has asked players to do everything they can to enhance the Tour brand, from adding tournaments to their schedules to showing appreciation to sponsors, pro-am partners and fans. Some are taking the plea to heart; Tour pro Robert Garrigus says that he now thanks tournament volunteers even after he makes a bogey. And now here comes the 33-year-old Woods as the Tour’s biggest attraction, something of a one-man stimulus package. “We’re going to bring some fans back,” says Rich Beem, winner of the 2002 PGA Championship. Even beyond Woods’ resumption of his pursuit of Jack Nicklaus’s record of 18 major titles — a mark Woods could tie by winning the Grand Slam this year — there are other benefits golf may soon realize with Tiger back in the fold. 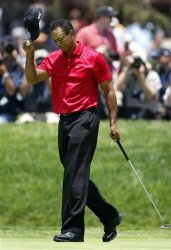 The Tour’s six-year contract with network television expires in 2012, and there is no bigger selling point than Woods as golf’s leading man. Beyond our borders the Tour, along with the game’s other governing bodies, submitted a bid last month to the International Olympic Committee to include golf in the 2016 Summer Games. Last year several top-ranked players from a variety of tours filmed a four-minute, 35-second video trumpeting their support for the initiative. The opening footage is of Woods pumping his fist. The closing scene has Woods saying that he could not think of a better sport to make an Olympic event. “Having the Number 1 most recognized athlete in the world playing our sport certainly is something that makes [it] even more attractive for the Olympics,” says Ty Votaw, the PGA Tour VP who doubles as the executive director of the International Golf Federation Olympic Golf Committee. Despite the demise of his endorsement deal with General Motors, Woods’ comeback stands to generate other business opportunities. On his bag he will carry the logo of AT&T, the company that sponsors his tournament outside of Washington, D.C., over the Fourth of July. Nike, which manufactures Woods’ clubs, balls and apparel, is also planning to release a new commercial timed to his comeback at the Match Play. The company often has launched commercials to coincide with Woods’ victories, including at the 2005 British Open and at last year’s U.S. Open, his final tournament before undergoing ACL surgery. Woods’ reentry paid immediate dividends for the Match Play. After attracting 128 media outlets and 379 journalists last year, when Woods defeated Stewart Cink 8 and 7 in the final, the tournament this year issued credentials for more than 175 outlets and 500 media members. The list includes the network nightly news shows, CNN, the BBC and even a publication from Sweden, the home country of Woods’ wife, Elin. The unanswered question is how well Woods will perform. He’s won 65 Tour events and 11 more tournaments worldwide, but will he be the same golfer after an eight-month layoff? Woods says even he is curious to see, but his peers have little doubt. They envision a golfer inspired by the birth of his second child (Charlie Axel, on Feb. 8), a golfer hitting shots pain-free for the first time in nearly two years, a golfer accustomed to carrying the game on his shoulders. The golf world and everything it touches can only hope. What A Show — Tiger Wins U.S. Open In 91 Holes! 91 Holes! After 4 days, another 19 holes is hardly what Woods’ worn knee needed! But at 32, and after three knee surgeries he wanted to win his 14th major which now leaves him four majors short of Jack Nicklaus’ record of 18. An 18-hole playoff wasn’t enough to decide the tie between Tiger Woods and Rocco Mediate today. They both shot even-par 71 over the first 18 holes, and headed to the par-4 seventh for sudden death at about 4pm EST Monday. Tiger and Rocco hugging before trophy presentation. Woods blew a three-shot lead and trailed by one, but got onto the par- 5 18th hole in two and made a four-foot putt for birdie. Mediate had a chance to win the tournament with a 20-foot birdie putt of his own, but he missed and had to make a testy three-foot comebacker to stay tied. This marked only the third time a U.S. Open playoff has gone beyond 18 holes. The last was 1994, when Ernie Els and Loren Roberts played to a draw, then went two extra holes before Els won his first championship. Mediate trailed by three heading into the 11th hole, but made three straight birdies on Nos. 13, 14 and 15 to grab the lead and force Woods to birdie the 18th to stay in the tournament. Woods did the same thing Sunday on No. 18 to force the playoff and stay in contention for his 14th major. He has never lost when holding at least a share of the 54-hole lead, as he did heading into the final round this time. Mediate was seeking his first major victory. At 45 years, 6 months, he would have become the oldest first-time major winner and the oldest man to win the U.S. Open.